I've been on the hunt for the perfect, from-scratch strawberry cupcake that resembles the strawberry cake from Wynlakes Country Club. But its been hard and they don't look like anything like it. So I decided to try out Paula Deen's Simply Delicious Strawberry Cake recipe, which uses cake mix and instant jello mix. I have never in my life made a cake with instant jello mix in it. There is always a first. All in all, the cake turned out delicious and it was exactly like the one served at our country club. Next time I'll use this recipe but probably make the batter from scratch rather than using a mix. Preheat oven to 350 degrees F. Line cupcake pans with liners. In a large bowl, combine cake mix and gelatin. Add pureed strawberries, eggs, oil, and water; beat at medium speed with an electric mixer until smooth. 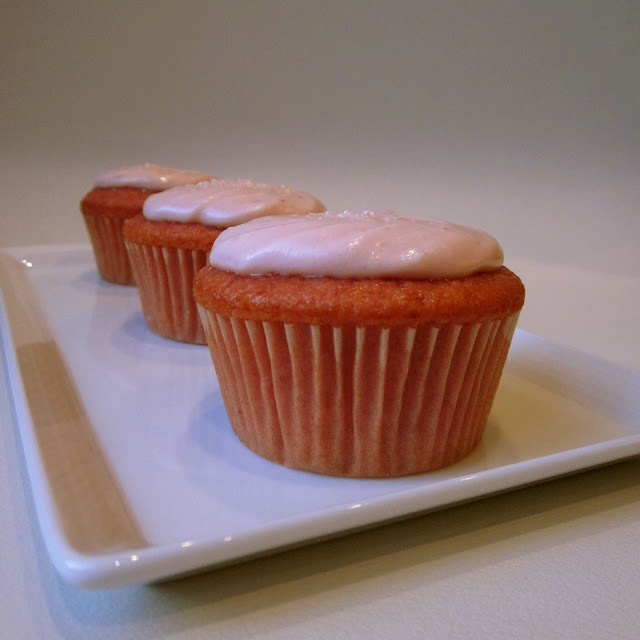 Pour into prepared cupcake pans, and bake for 20 minutes, or until a wooden pick inserted in the center comes out clean. For the frosting: In a large bowl, beat butter and cream cheese at medium speed with an electric mixer until creamy. Beat in 1/4 cup of the strawberry puree and the vanilla extract. Gradually add confectioners' sugar, beating until smooth. The cupcakes look so good. thanks joy! there were also delicious!